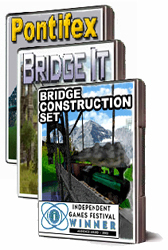 The Bridge Building Bundle includes Bridge Construction Set, Bridge It Plus and Pontifex. Get all three Bridge Building games together and save! Immediately after completing your order for the Bridge Building Bundle for download you will receive an e-mail with instructions for downloading the full version of all three games. It is very important you use a working e-mail address when ordering.